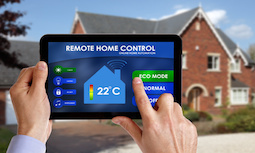 Using technology to make life easier in and around the home is absolutely booming! Our team at Natural Audio are highly skilled in providing the latest and greatest in Home Automation. You’ll be shocked at what’s possible! Imagine controlling your thermostat or lowering the shades with your smart phone! Today it is not only possible, it is economical and provides tremendous value to your home and busy schedule. Below is a list of things that can now be controlled simply and effectively. -Schedule your lighting to make life simpler and increase safety. Illuminate your hallways automatically when you walk by. -Lower or raise with 1 touch! Or schedule the opening and closing your shades to maximize comfort and protect furniture from direct sunlight. -Activate you security system and monitor your home with your smart phone. Security and surveillance has never been easier. – Control temperatures, lights, cleaners and even waterfalls with the touch of a button! At Natural Audio, we work to deliver the best results to our clients based on your needs. We are able to offer the best fully-integrated lifestyle systems to offer the ultimate in elegance, simplicity, comfort and convenience. You’ll love our work as do not believe a project is done until you are 100% satisfied and all your questions have been answered.